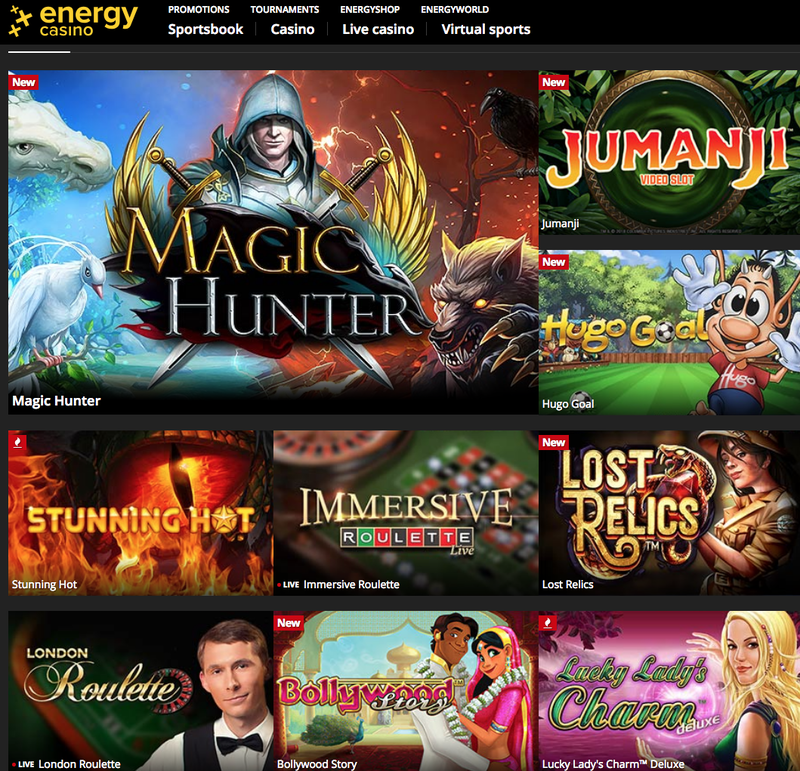 Launched in 2012, Energy Casino is one of the largest Novomatic casinos to be found online, while also offering a host of games from other providers as well. In its few years on the scene, Energy Casino has gained quite a following for itself, not least because of its varied payment options and swift withdrawal times. When a site does the small things right (although obviously the ability to withdraw winnings quickly is not exactly a small thing, it often falls behind promotions and games as far as customer priorities go) it tends to be a good sign, suggesting that all aspects of the site will be handled with the same levels of care and professionalism. With a name like Energy Casino, you would expect to find a theme to match, high octane, adrenaline fuelled approach to design, and that is very much what you will get here. However, if you’re expecting a mass of noise, colour, and animation, in a way that can be so off-putting at other sites that choose to take a similar direction with their concept, you will be pleasantly surprised here, as the site manages to bring its theme to the forefront without having to actively shove it down your throat. Black and orange are the main colours at Energy Casino, with a rather charming and very simple logo greeting you on arrival. There’s a scrolling banner across the top of the page that gives you many a colourful image, complete with information on games that are available on the site as well as the promotions on offer. It is nothing new these days to have a selection of the best games on a site accessible directly from the homepage, but Energy Casino goes one better, you have a large amount of titles on the homepage when you get to it, and a click of the ‘show all’ tab will land every single game, split into simple categories, available immediately. In a world, especially an online world, when instant access is of the upmost importance, Energy Casino has managed to find a way to satiate this appetite without affecting the look of their site in any negative way. All in all, Energy Casino is a pretty excellent execution of a design theme based fully around a concept without getting lost in the idea. As well as having one of the biggest collections of Novomatic games you will find anywhere outside of land based casinos, Energy casino also offers games from a wide range of other service providers, including NetEnt, Microgaming, Quickspin, Genesis, Greentube, Mazooma, NextGen, Rabcat, and Oryx, so you know you’re not going to struggle for choice here! If you like your new releases, you’ll find a strong selection of them here, including Jimi Hendrix, Football: Champions Cup, and Fantasini: Man of Mystery. If you prefer the more tried and tested popular titles, then you’ll find Starburst, TwinSpin, Jack and the Beanstalk, Gonzo’s Quest, and more. A big selling point for Energy Casino is its huge range of progressive and jackpot games, perhaps one of the biggest online, which will be a temptation for any player. With video poker, roulette, and a range of other table and card games, as well as the option to search by provider to make your search easier, there isn’t much that Energy casino hasn’t thought of. Perhaps the site would benefit from some scratchcards and other gaming options, but that aside, this is an excellent site with a lot to love for players of all levels, from the newbie to the veteran.